Your bedroom is supposed to be your sanctuary, a place where you lie down at the end of the day and let your worries drift away. Instead, your bedroom quickly turns into a storage area where you dare not let anyone enter. 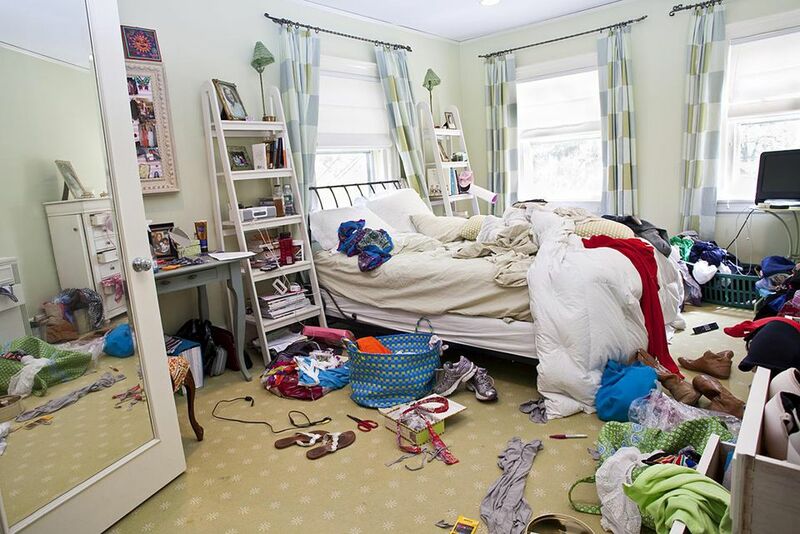 Learn a quick cleanup for your room that will let you find the bed and the floor. Here's how. A vacuum cleaner or broom. Since you're in a hurry, don't worry about unrolling socks, and pulling shirts right side out. These tasks are easier to do while sorting the laundry. Just grab all of the dirty clothes and place them in the hamper. If you have a significant amount of clean clothing lying around waiting to be folded and hung, skip this step and place the clean clothing semi-neatly on your bed after you make it. You can hold your bed hostage and remind yourself to take a few minutes to put away the clothing before bed. Yes, we know there is a major debate about whether or not to make the bed. You are just going to get back into it in a few hours. But if we used that argument for other areas of our home, we would never have clean floors, dishes, or laundry. Why wash something when it's just going to get used again? Making the bed changes the look of a room. It makes a room more inviting and uncluttered looking. Put them in a basket, box, or bag. These are items that belong in another room in the house. Don't try to take them back one at a time. Just put them all in one location for now and move on. If it has been a long time since you have cleaned in here, you may have large accumulations of your stuff that belongs in your room but is not in its proper place. Take a brief survey of this "stuff". If in a minute or less you can put it all away, do so. If not place it all in a container so that you can go through it and organize it later. Don't move furniture to sweep or vacuum. Just do a quick run through. If you have a few minutes leftover, grab the baskets of "stuff" and place the items in it in their proper areas. Do not let yourself leave the miscellaneous baskets unattended for too long. The contents will pile up, spill over, and lead to more mess. If you do not have time now to sort through them, take another fifteen minutes sometime in the next day to do so. Make sure you remembered the clean clothes. If there were too many to fold and put away, are the neatly waiting on your made bed? Allow yourself to reflect on how much nicer this briefly cleaned room is. If you keep up this regime regularly in your room, you'll always be able to find your bed. And isn't that what we all want.